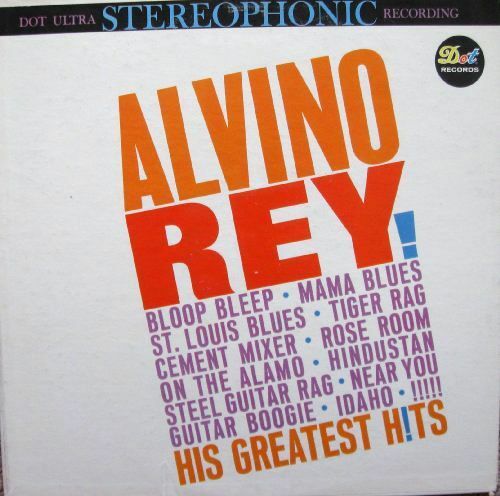 Alvin McBurney (July 1, 1908 – February 2, 2004), known by his stage name Alvino Rey, was an American swing era musician and pioneer, often credited as the father of the electric and pedal steel guitar, plus the vocoder. For the most part, he was associated with orchestral, big band and swing music, and towards the end of his career, jazz and exotica. Alvin McBurney was born in Oakland, California, in 1908, but moved with his family to Cleveland, Ohio. He showed very early signs of his mechanical and musical aptitude; he built his first radio at the age of eight and, within a couple of years, became one of the youngest licensed ham operators in the country. His interest in music grew when he received a banjo as a tenth birthday gift. 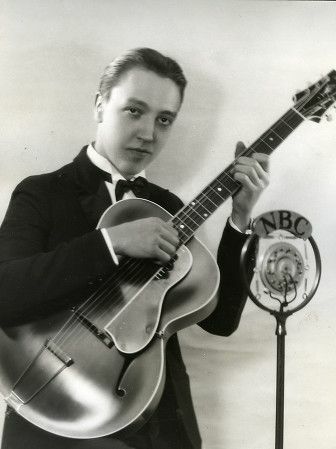 He began studying guitar at the age of 12, listening to recordings by guitarists Eddie Lang and Roy Smeck. At age 15 he invented an electrical amplifier for the guitar, but neglected to have it patented. He did patent several later versions. In 1927, Rey landed a job playing banjo with Cleveland bandleader Ev Jones. "Yes, I joined the Union when I was 16", he said. He practiced amplifying acoustic instruments as a teenager, starting with this first banjo. "I went to Lakewood High School and from there I went to New York and never did come back." he recalled. 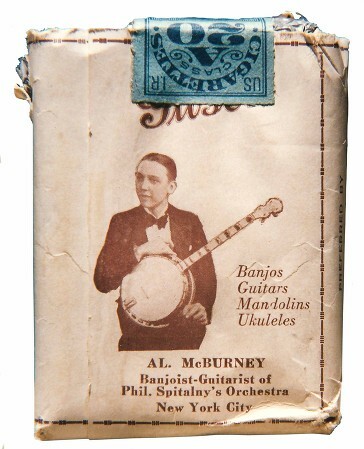 His career began in 1927, when he played banjo with Ev Jones. He signed with Phil Spitalny that same year, playing electric guitar in Spitalny's Orchestra. "I spent two years in New York with Phil Spitalny and then went to California," Rey recalled. "I joined Horace Heidt in San Francisco . 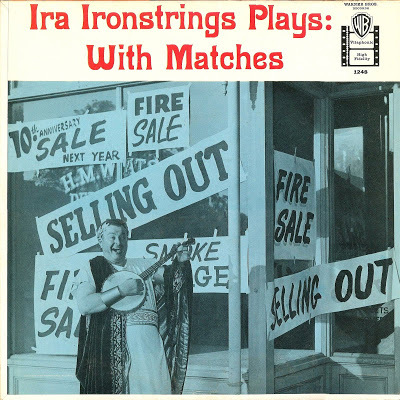 . . he had a stage band, sort of like Fred Waring." During this time he also studied guitar with vaudeville performer Roy Smeck. Alvino played in other bands, including alongside such names as Russ Morgan and Freddie Martin. While playing with Phil Spitalny's orchestra in New York, he changed his name to Alvino Rey in late 1929, to coincide with the Latin music craze in the city. 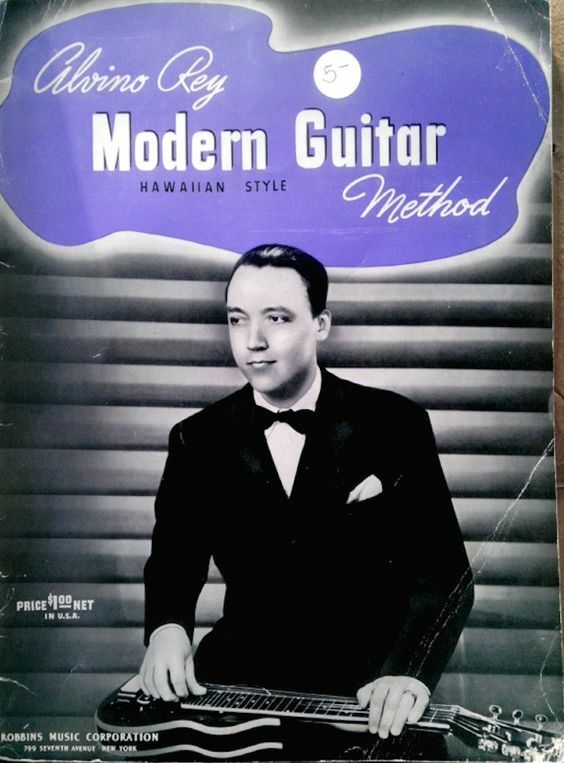 From January 1932 to early 1939 Alvino played steel and Spanish guitar and in Horace Heidt's musical group, Horace Heidt And His Musical Knights. Here he pioneered the instrument, as well as becoming known for his unique sound, becoming one of the best-known (and best-paid) sidemen in the country, thanks to Heidt's weekly radio program. "And there I met the King Sisters, and I married Luise, one of the sisters, in 1937", Rey later recalled. 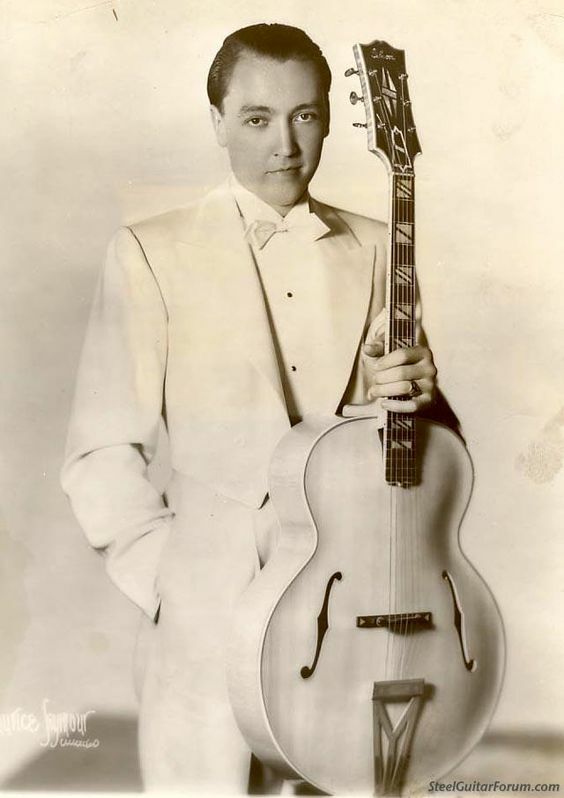 In 1938, when the Musical Knight's band landed a spot at the Baltimore Hotel in New York, Heidt was bitter and irritated that the sponsor signed them up because they were impressed by Alyce King's vocals. He took the first opportunity to fire her - when she dropped her microphone and it hit an audience member. The other Sisters immediately resigned, followed by Alvino, and then saxophonist Frank DeVol. 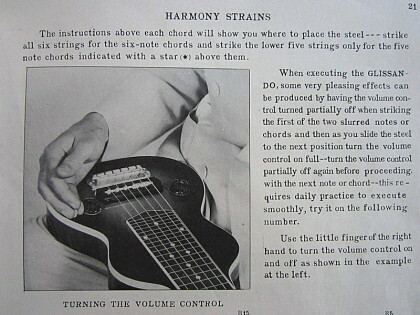 By the mid 1930s, pressure was on Gibson to add an electric guitar to its catalogue. 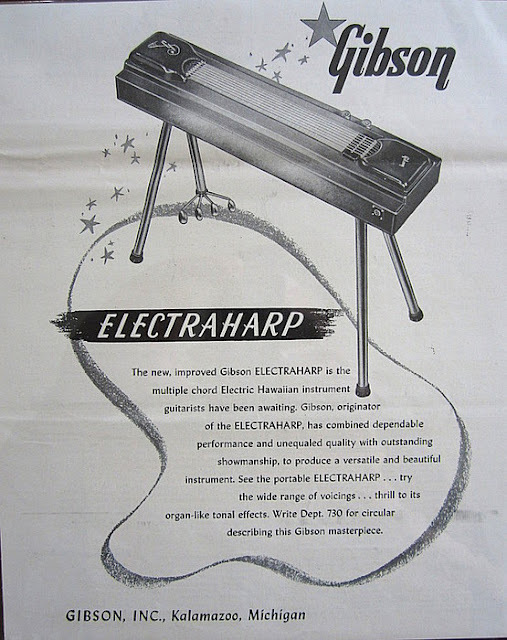 Both Electro (Rickenbacker) and National-Dobro now offered electric instruments and when Epiphone – Gibson’s main rival at the time - threw its hat into the ring, Gibson had little option but to develop an electric guitar and amplifier set of its own. Lacking the necessary R & D facilities, the company outsourced the project to Lyon & Healy, where electrical engineer John Kutilek was given the task of designing a pickup that didn’t infringe existing patents. 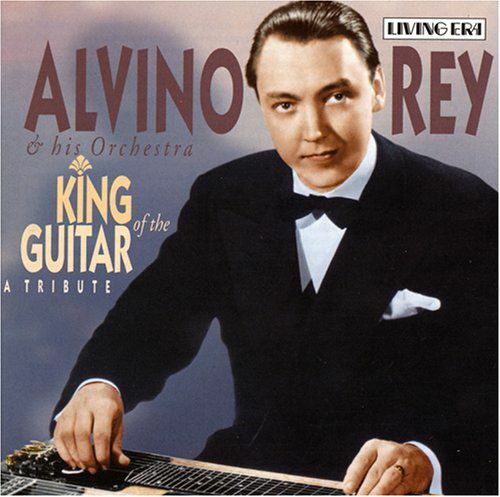 Guitarist Alvino Rey - who was the number one electric player at the time - was taken on board in an advisory capacity. Alvino would fly up to the Gibson factory in Kalamazoo whenever he got the chance - he had his pilots license before he had a drivers license. 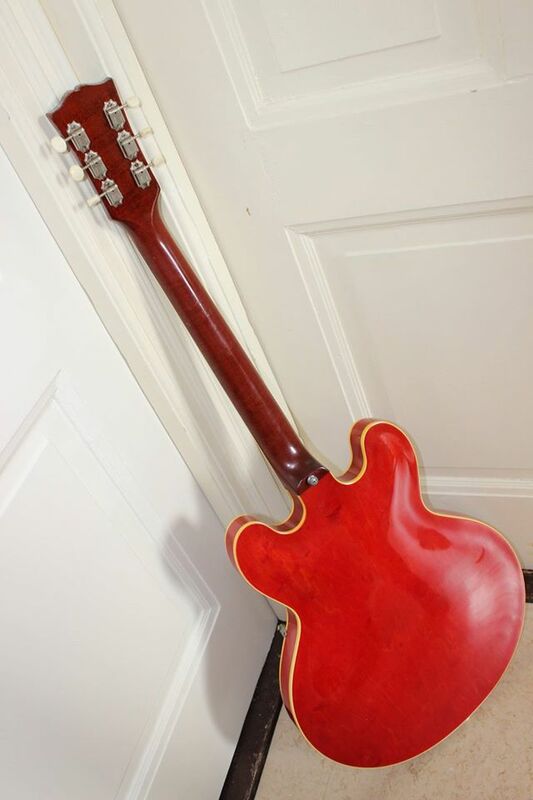 The company may have viewed his involvement in the project as legitimising Gibson’s entry into the field of electric instruments in the same way that guitarist Les Paul’s name was later used to promote the introduction of Gibson’s first solidbody in the early 1950s. 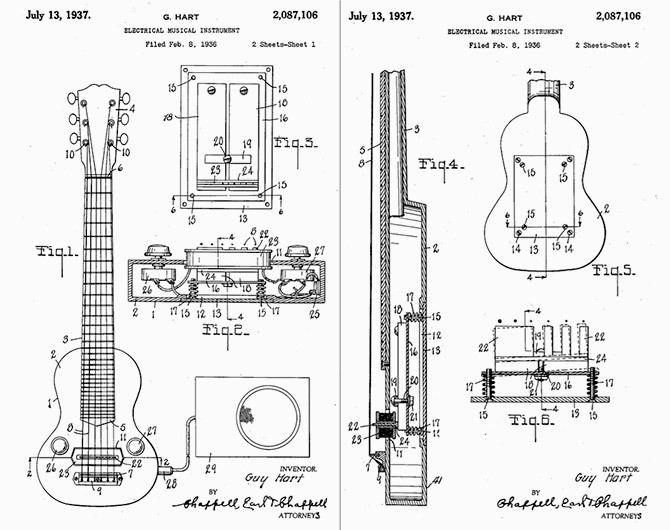 After several months of experimentation, Guy Hart relocated the project to Gibson’s Kalamazoo factory, where Walter Fuller replaced Kutalek as the man in charge of the new pickup’s development. 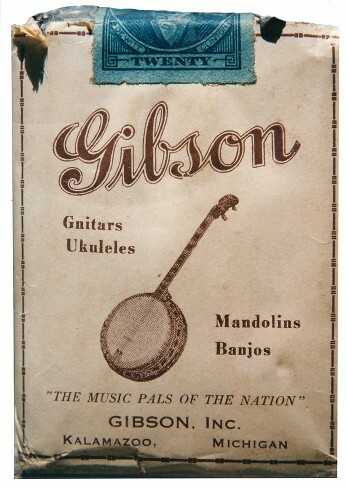 Introduced in 1935, Gibson’s first production electric guitar - initially referred to simply as the Gibson Electric Hawaiian - incorporated Walter Fuller’s pickup. 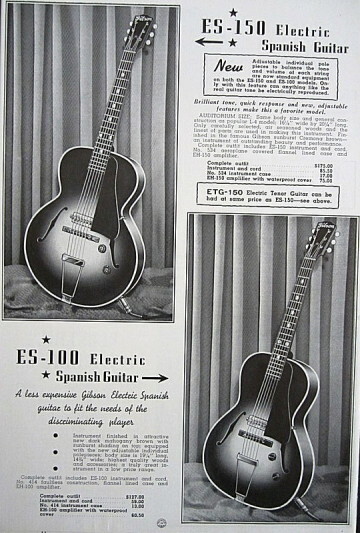 A similar unit was installed in the ES-150 electric Spanish guitar, which Gibson launched the following year. The ES-150 was subsequently adopted by a young black musician from Oklahoma City named Charlie Christian and the rest, as they say, is history! 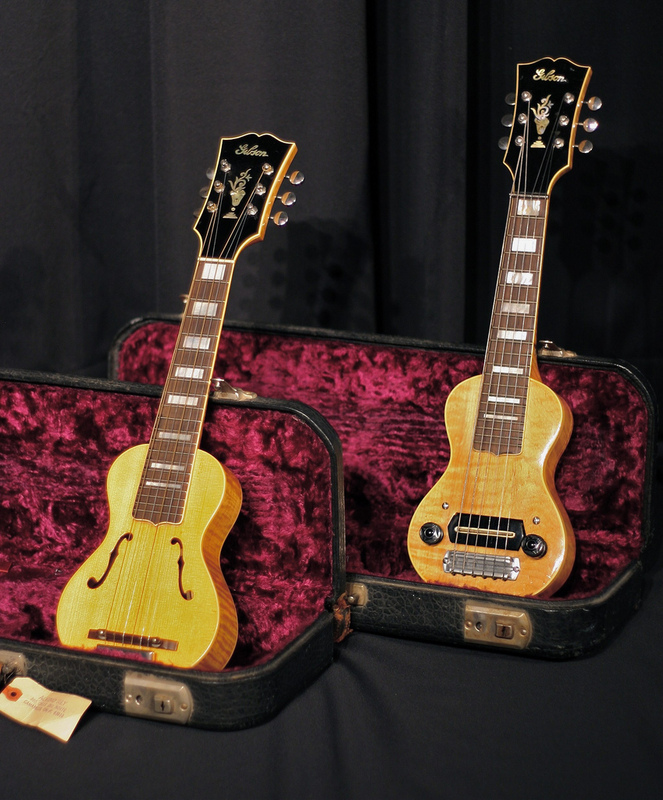 Built by Alvino Rey and John Kutilek as a test bed for their new pickup, the instrument pictured here comprises a simple frame to which a vestigial ‘body’, fingerboard and headstock – all of which are fabricated from sheet brass – are attached. Hardware includes a brass nut and bridge, inexpensive tuners and a basic trapeze tailpiece. The pickup itself consists of two magnets with the strings running between the top magnet and a coil of wire. The pickup was hardwired with no jack socket or controls. 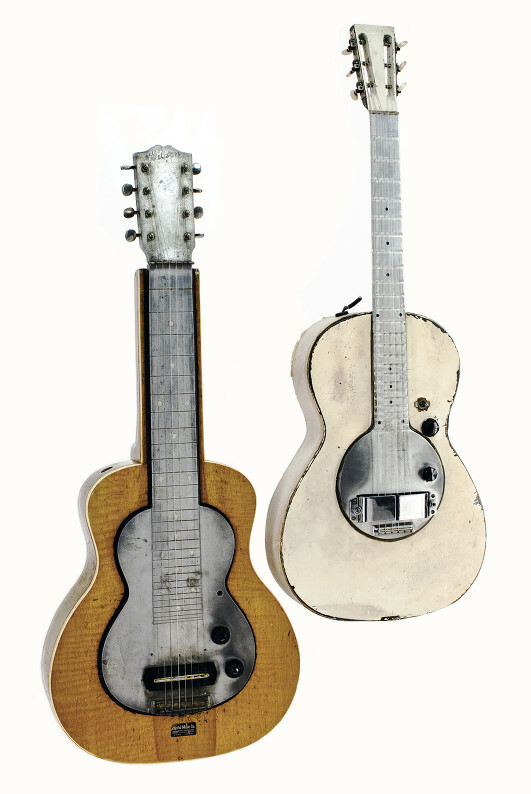 In spring of 1935 Rey was hired by the Gibson Guitar Corporation to produce a prototype pickup with engineers at the Lyon & Healy company in Chicago, based on the one he developed for his own banjo. The result was used for Gibson's first electric guitar ES-150. The prototype is kept in the Experience Music Project museum in Seattle, commonly known as the Hendrix Museum. 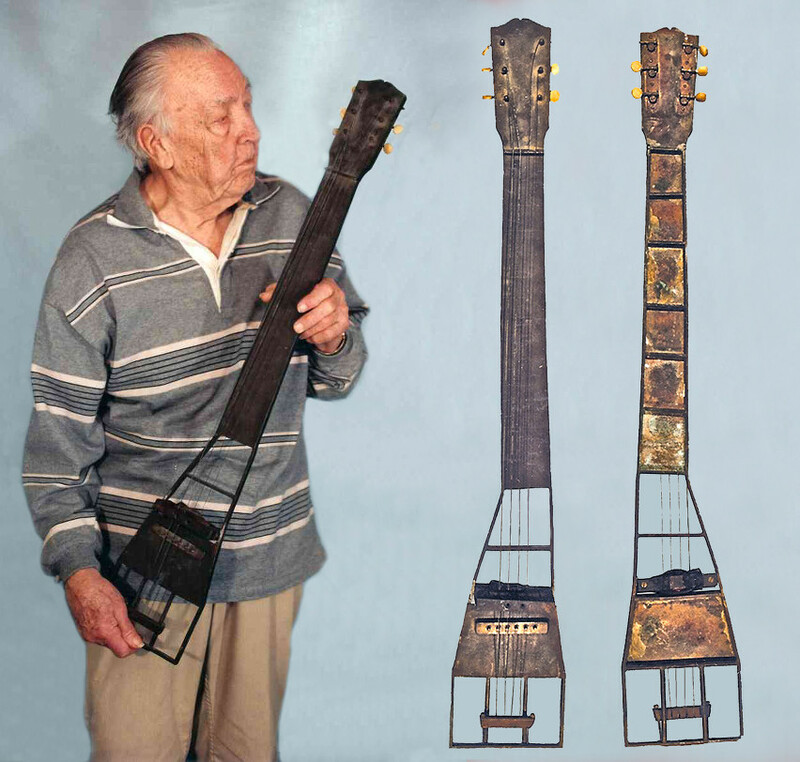 Starting in 1939, Rey used a carbon throat microphone to modulate his electric guitar sound. The mike, developed for military pilots, was worn by Rey's wife Luise, who stood behind a curtain and sang along with the guitar lines. The novel combination was called "Singing Guitar", and later became known as the Sonovox. Along with early Vocoders (initially called Voders), which were initially developed to scramble messages between the Pentagon and field commanders during WWII, the Sonovox innovation was one of the first known talk box experiments. The vocoder (Voice Operated ReCorDER) combines two audio sources by imposing the dynamic frequency spectrum of one onto the other. 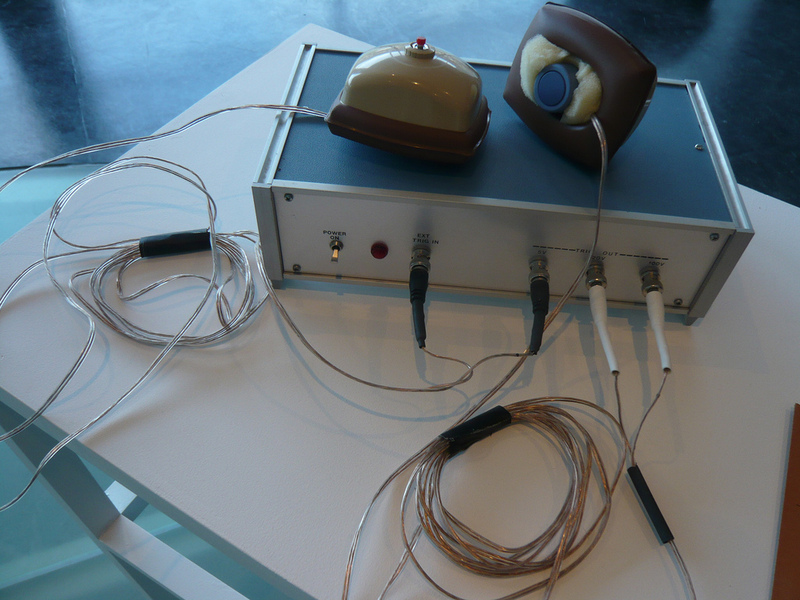 The most common vocoder effect, a "talking" musical instrument made by superimposing human vocal utterances onto an instrument's audio, was first attained by a device called a "talk box", where audio from the instrument was piped, usually by a tube or neck-mounted speaker, into the player's mouth, where it could be enunciated and picked up by a microphone. 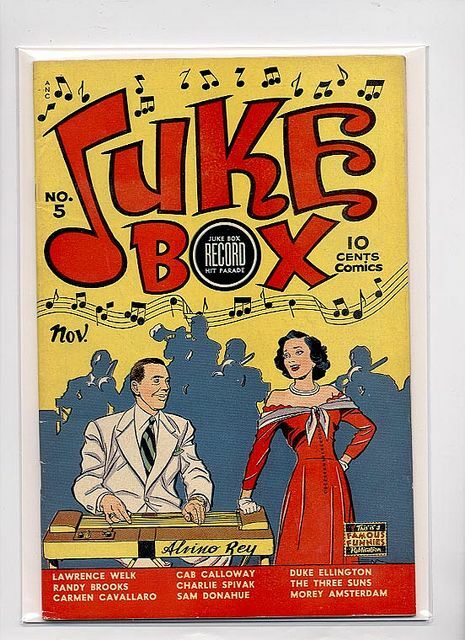 Steel guitarist Alvino Rey used a 1939 talkbox called the Sonovox to create his early "talking steel" hits. In January 1939 Rey left Heidt to become musical director of KHJ, Mutual network station in Hollywood. So successful was his house band and so much comment did it excite that Rey took his key men and his singers (the Four King Sisters), packed up and went east to try making a go of it as a dance band. There followed a build-up period, climaxed with a stay at the Rustic Cabin in New Jersey. Rey formed his own group with the King Sisters (as lead singers) and Frank DeVol, heading for Los Angeles. The band was Mutual Broadcasting's houseband for three years, and through the band passed such musicians as Johnny Mandel, Paul Fredricks, Skeets Herfurt, Neal Hefti, Dave Tough, Mel Lewis, Don Lamond, Andy Russell, Alfred Burt and three of Woody Herman's future "Four Brothers" sax section: Al Cohn, Zoot Sims, and Herbie Steward. Notable arrangers in the band included Nelson Riddle, George Handy, Billy May, Ray Conniff, and DeVol. In 1941 the group filled in for Dinah Shore at New York's Paramount Theater, which led to greater exposure. Soon afterward, they became one of the most popular acts in the country, while recording top ten hits and making appearances in Hollywood films. 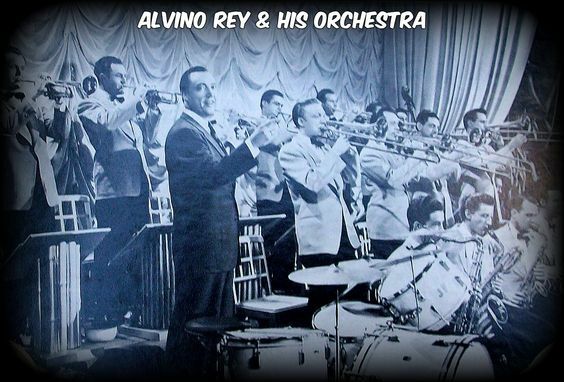 In 1942 Rey re-organized the orchestra, expanding the brass section. Although very popular, the recording ban by the Musicians' Union later in 1942 put a temporary end to their recordings. The ban led to financial hardship for the band, who all took jobs at a local war-plant - the Lockheed aircraft factory in Burbank. Rey worked as a mechanic. During this time the group disbanded. In 1944 at age 36, Rey joined the United States Navy; he passed the Eddy Test and attended the Electronics Training Program, becoming a radar maintenance technician. In this period, he also led a service band, the Radio Chicago Orchestra. After his discharge in late 1945, he formed a new orchestra, which signed with Capitol Records and immediately produced a hit, a cover of Slim Gaillard's "Cement Mixer". Despite this, the band broke up around 1950, and Rey went on to lead smaller bands, sometimes with his brother-in-law, Buddy Cole. This continued through the 1950s, mostly in Southern California. 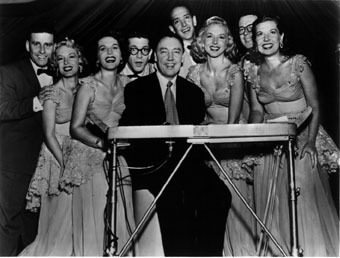 In the late 1950s, Rey served as musical director for the King Sisters. 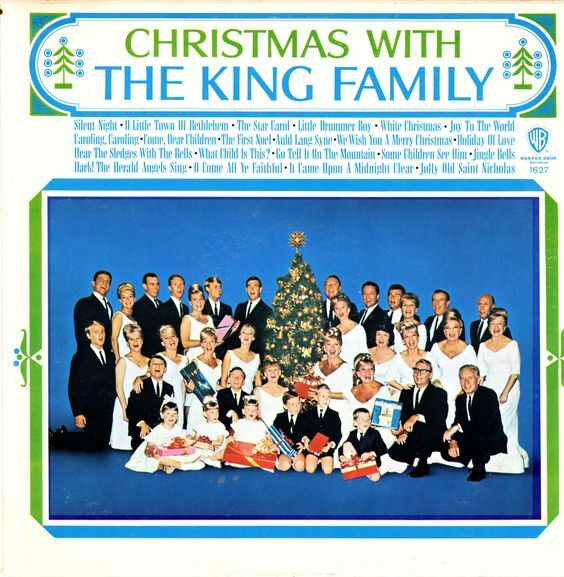 In 1965, ABC aired a special featuring the King family, which grew into a series (called The King Family Show) spanning five television seasons. Rey was musical director for the show, simultaneously producing a series of record albums featuring the cast of the program. 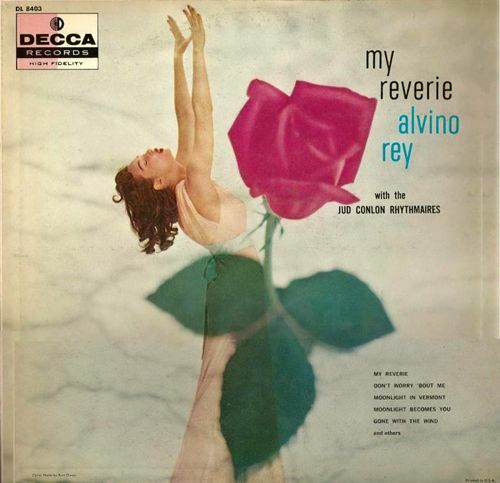 After the ABC show Rey worked on exotica projects with such artists as Esquivel and George Cates. Rey teamed up with Jack Constanzo and other session aces in the Martin Denny-inspired Surfmen for Somerset Records. 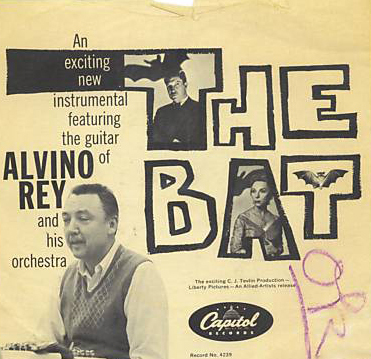 He played the theme to the film The Bat (1959). He continued performing well into his eighties, leading a band that played Disneyland each year from the theme park's opening in 1955. 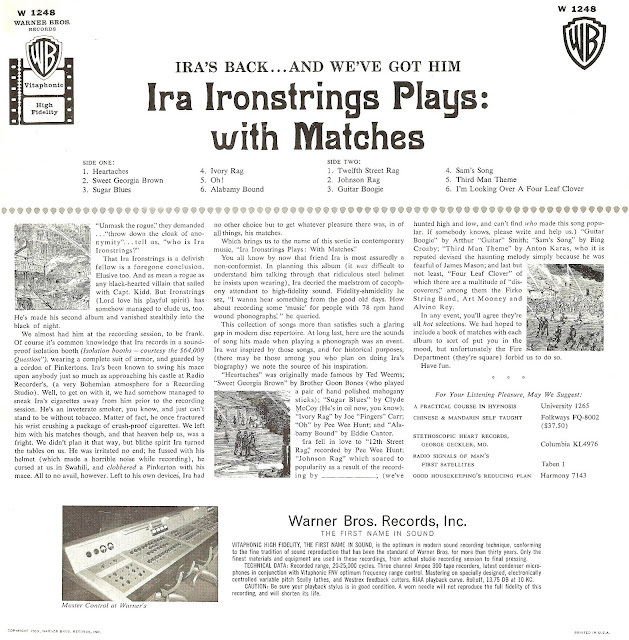 Rey also made a series of comic instrumental LPs for Warner Bros. Records under the pseudonym Ira Ironstrings. His use of an alias was partly because of his ongoing contract with Capitol. 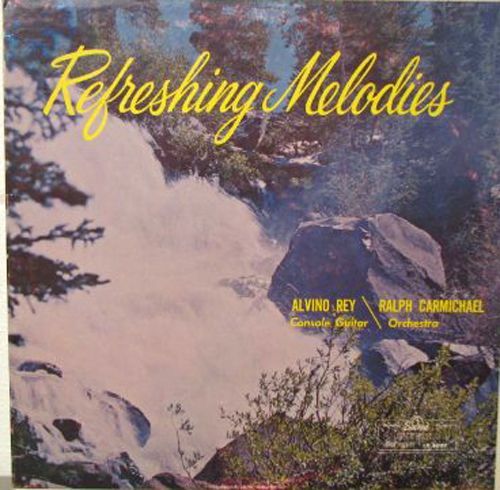 Beginning about 1957, Rey produced many of the George Greeley piano recordings for the Warner Brothers label. In the early 1990s, Rey moved with his wife Luise to her native Utah, where, in Salt Lake City, he formed a jazz quartet which played clubs locally with Luise sometimes sitting in. The couple finally retired in 1994 and his last public appearance was the same year, but he retained his interests in music and electronics into his mid-nineties. Luise died in 1997, after 60 years of marriage with Alvino Rey. Some sources claim Rey became a Mormon about the time of his marriage to Luise King in 1937. However, it appears he was not actually received into The Church of Jesus Christ of Latter-day Saints until 1969. Rey's daughter, Liza Butler, is the mother of Win and Will Butler, members of Canadian indie rock group Arcade Fire. Their debut album, Funeral, was heavily influenced by Rey's death, along with the deaths of relatives of other members of the band, during the recording period. 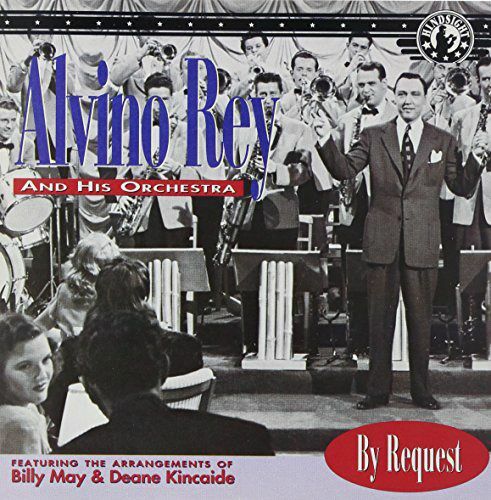 The band released a live 1940 broadcast recording of Rey's song My Buddy, which appears as a B-side on their singles "Neighborhood No. 1 (Tunnels)" and "Neighborhood No. 2 (Laika)." In 2004, after breaking his hip and suffering complications including pneumonia and congestive heart failure, Rey, a widower, died at age 95, at a rehabilitation center in Utah. He was still an amateur radio operator, holding the call W6UK. Here's the second LP by Ira Ironstrings; The name was a pseudonym used on a string of albums recorded by bandleader / guitar innovator Alvino Rey. In the earliest days of Warner Bros. Records, the label had something of an 'anything goes' attitude while they were establishing themselves. 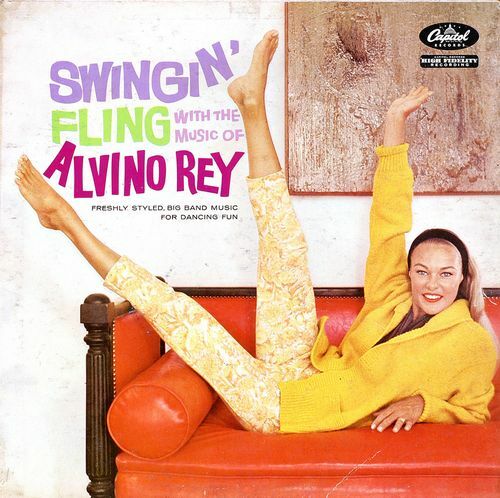 Alvino Rey was brother-in-law to WB exec Jim Conkling, and had the idea for recording campy, light-hearted (though not quite 'novelty') hi-fi Dixieland music. 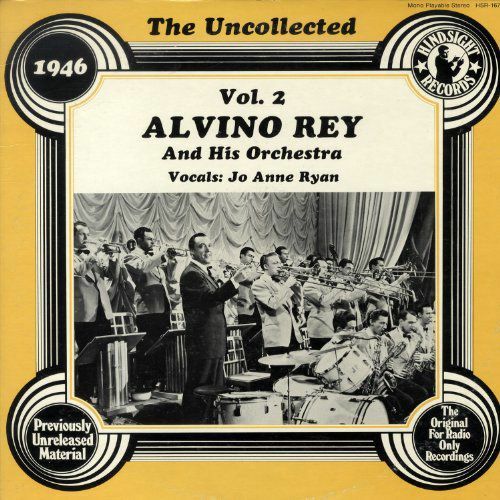 The pseudonym was used because Rey was still under contract to Capitol Records, but the name and the mystery around it added to the fun. Produced and arranged by Warren Barker, the quality of the music surpassed many expectations. Electronic music pioneer Alvin McBurney, known by his stage name Alvino Rey, created the first electric guitar in 1927 when he attached electrical wiring to his banjo and played it through a radio speaker. 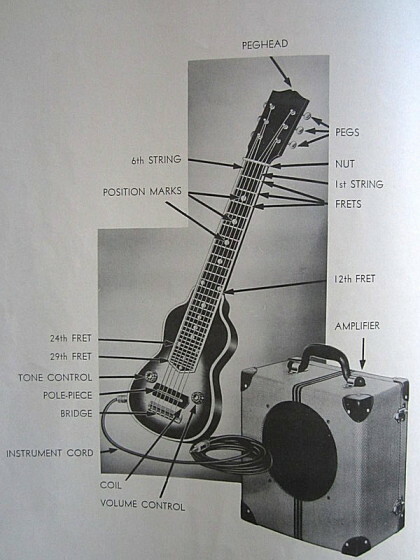 In 1935 Rey produced the very first electronic pickup for Gibson’s ES-150. In this video, Rey, using his steel guitar, appears to be creating the singing voice for bizarro “Stringy The Talking Guitar.” In fact, it was Rey’s wife Louise, in tandem with Rey’s guitar sounds, that created the effect. Louise was backstage with a carbon throat microphone attached to a piece of plastic tube running to Rey’s amplifier. She would provide the words and Rey would alter them by sliding the steel bar along his guitar strings. Rey and Louise were able to create some otherworldly sounds using this technique, including the weird voice of Stringy. Rey’s invention eventually evolved into the talk box, appearing to mindnumbing effect on the Frampton Comes Alive album. 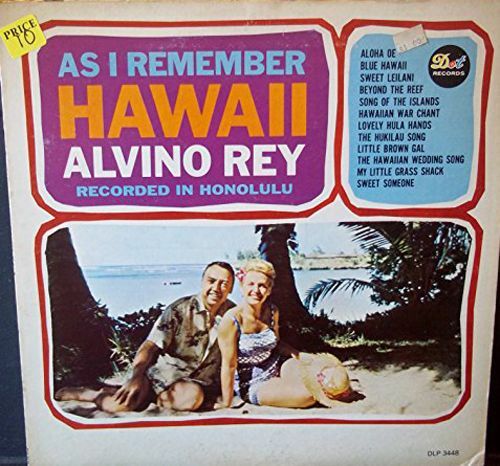 Rey recorded with Esquivel, Martin Denny, The Surfmen and played on many “exotica” albums as well as film soundtracks, including Elvis’s Blue Hawaii. He died in 2004 at the age of 95. 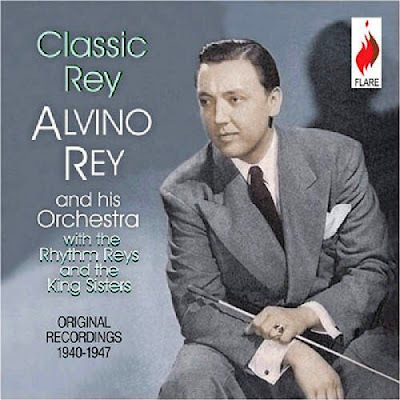 Alvino Rey & The King Sisters celebrate their 25th Anniversary with The Alvino Rey Orchestra in this compilation of excerpts from their 1965 television series "The King Family Show." 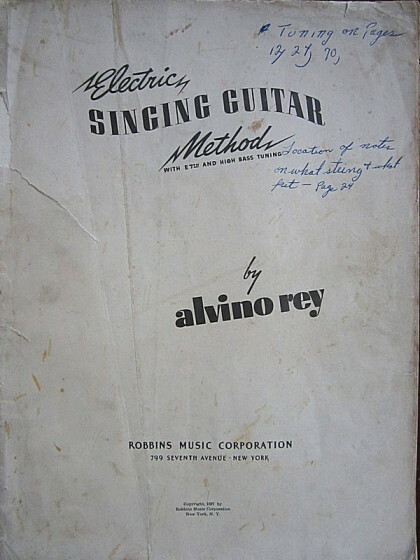 Alvino Rey, one of the pioneers of electric guitar, shows off his “singing guitar effect” in this short film, circa 1944, featuring Stringy the talking guitar puppet. According to Wikipedia, “In 1939, Rey used a carbon throat microphone to modulate his electric guitar sound. The mike, developed for military pilots, was worn by Rey’s wife Luise, who stood behind a curtain and sang along with the guitar lines. The novel combination was called “Singing Guitar”, but was not developed further. The innovation was the first known talk box experiment.” Wow! 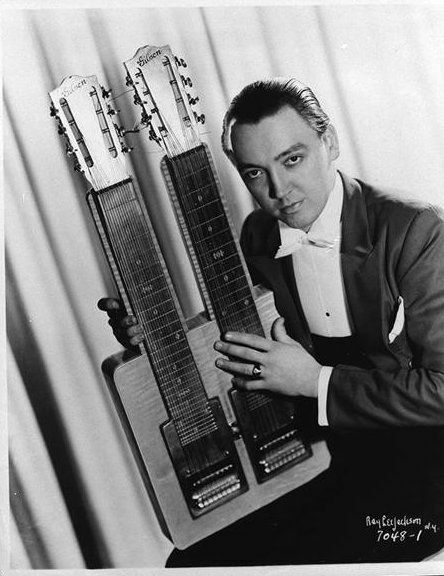 Electraharp pedal steel guitar, which he called his console, using six pedals to bend the steel strings. The Gibson Guitar Corporation used a system of pedals to change the tuning of the strings on one of their console steels beginning in 1940. This instrument, the Electroharp, had a cluster of pedals radiating from its left rear leg that operated similarly to the pedals on a harp. 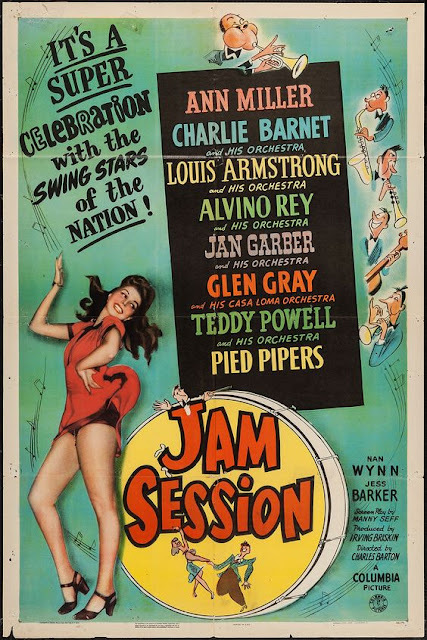 Educated in the Cleveland, Ohio, suburb of Lakewood, Rey played the banjo locally, toured, and, in New York, played in the Porgy And Bess pit orchestra while studying guitar with Ray Smeck, who pioneered the electric guitar. In 1934, Rey joined Harold Heidt's Musical Knights, becoming one of America's highest-paid sidemen. 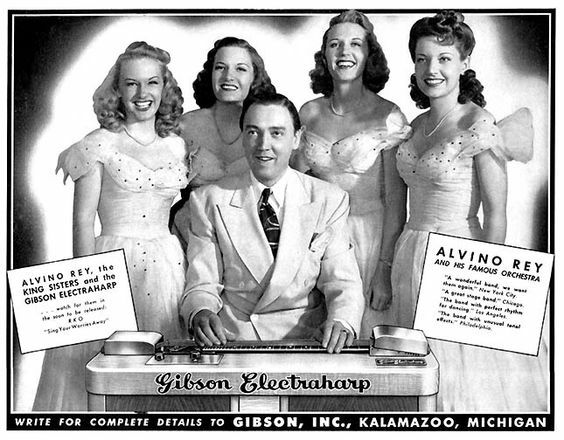 Heidt featured the singing King Sisters, and, in 1937, Rey married Luise King. In 1939, Heidt fired lead vocalist Alyce King, and Rey and the other sisters quit, and started their own orchestra. 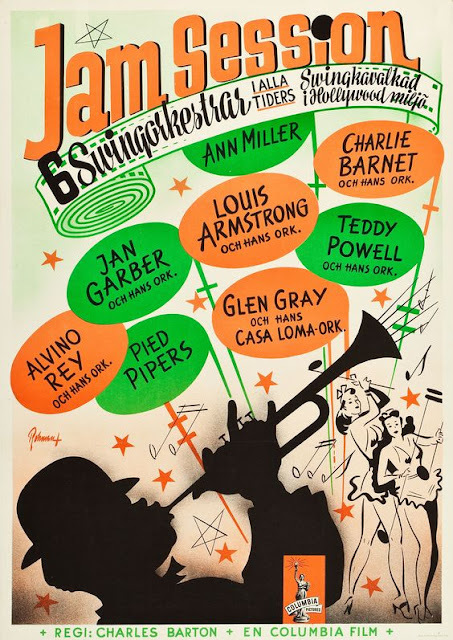 They broke all records at the Paramount Theatre in Los Angeles and became the Mutual radio network's house orchestra. He had a massive hit with Deep In The Heart Of Texas. 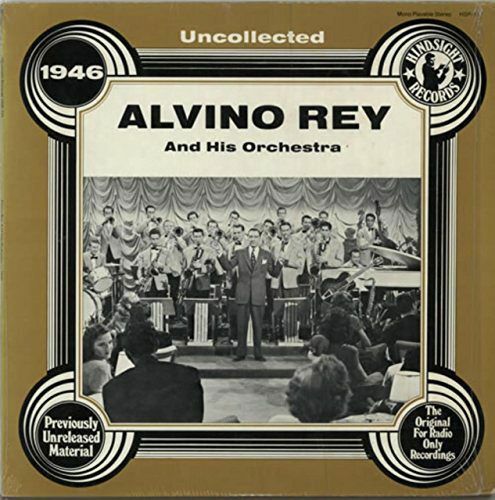 From 1944 to 1945, Rey served with the US navy, but after the war returned to the charts with Cement Mixer, his guitar providing appropriate sounds. His signature tune, Blue Rey, featured Luise's vocals fed through his guitar amplifier, a trick well ahead of its time. When big bands declined at the end of the 1940s, he played in small combos with his brother-in-law, organist Buddy Cole. 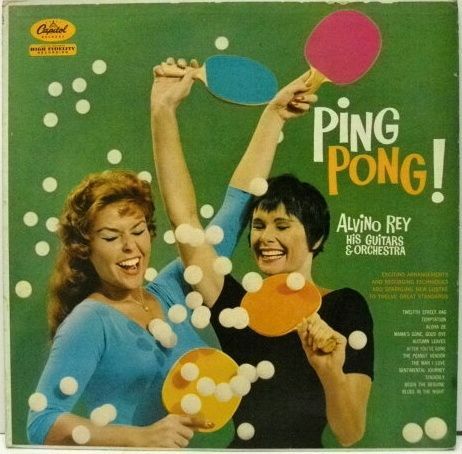 He had one more hit, Ping Pong, capitalising on the crazes for table tennis and stereo: his steel guitar notes "bounced" between the two speakers. 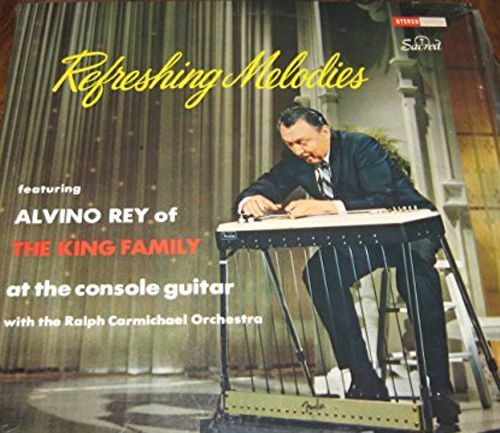 He returned to the limelight as Alvino Rey And His Talking Guitar on The King Family ABC-TV variety show (1965-71). In the 1980s he led an orchestra at Disneyland. He had converted to his wife's Mormon faith, and formed a quintet that played around Salt Lake City. In 1996, he made his final appearance, with Luise singing, at the Utah centenary celebrations. His wife died in 1997. Two sons and a daughter survive him. When I was a teenager in the 70's I was not very much interested in f hole style guitars. During that period Led Zeplin, Deep Purple, Pink Floyd ruled the charts. A les Paul or a Stratocaster was what you should have those days. I still remember Johnny "Guitar" Watson. His clear bright cutting sound of his guitar solos, the groove of his music, it was something we had never heard before. 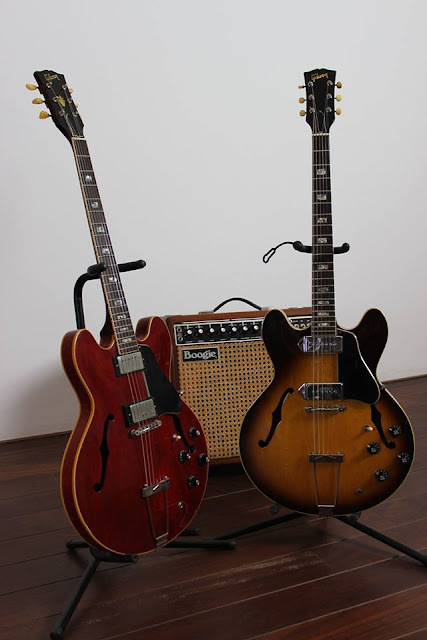 Johnny made the Gibson ES335 definitly an acceptable instument to have for the kids of my age. The picture shows a 1968 ES330 and a 1971 ES335 with a Mesa Boogie mark1 amplifier. Once the tools to make the future vintage. Only recently the foothills in Nagano Prefecture have begun to have the appearance of summer. Normally, even in the high altitudes here, middays are hot; but this year in mid-July there were days when the temperature did not rise above 13 or 14 degrees centigrade. There was even winterlike cold sleet. The weather bureau’s satellite has been analyzing the weather, and although forecasts have been fairly accurate, still they are not dependable. Science has been researching materials and energy. We are in an epoch of informational science, yet for us the unknown is immeasurably vast. With the knowledge that so much is beyond human control, I am somewhat relieved. The wind begins. The mists lift. The blue-black mountains are suddenly revealed, and I look, wondering if they were always there. In such moments I feel, within, the musical impulse. This is not inspiration arising from dramatic confrontation. In nature there are subtle continuous changes as well as sudden violent changes. Perhaps I am one of those who try to see the invisible, to hear the inaudible. Human perception is not uniform but has varying levels. Therefore, what I felt cannot be experienced directly by another. But I am not alone. I live—and at the same time am made to live. By what? By whom? My music is something like a signal sent to the unknown. Moreover, I imagine and believe that my signal meets another’s signal, and the resulting physical change creates a new harmony different from the original two. And this is a continuous, changing process. Therefore, my music will not be complete in the form of a score. Rather, it refuses completion. This is quite different from the Western artistic intention. As one who has dealt with Western music with great respect, pursuing composing as a livelihood, I have arrived at a great contradiction, which is unresolvable, and which is even enlarging. I wonder, but cannot determine, if all Japanese (Asian, Far Eastern) composers also feel that contradiction. I am not a composer who represents Japan, not even a “Japanese” composer. Born and raised in Japan, aware that I am influenced by its culture, even as I try to free myself from that influence, at the same time I am fully aware that is impossible. Less and less in recent times am I regarded as a “Japanese” composer (of Western music). I still experience that uncomfortable feeling when abroad. The breadth of human understanding does not seem to have widened, although there are changes. There is no doubt that the development of informational science has moved from quantity to quality and that there is a movement from regional differences toward a global culture. Though it may sound contradictory, I don’t think that should be so simply done. What will simple unification produce? There is an advantage for a Japanese composer who has studied modern Western music—music from a completely different culture. That is, he can view his own Japanese tradition from within but with another’s eyes. Any culture should be understood as distinctive of an area, yet changing, free from the concept of nation or institution. Will not true mutual understanding develop only from this attitude? For the human to be independent and free seems like an infinite task. I do not stop composing, because I cannot give up hope of being one of these gardeners cultivating infinite time. Moved by the view of those mountains, lost in thought, I found that time passed quickly and the mountains were again covered by clouds, lost from sight.